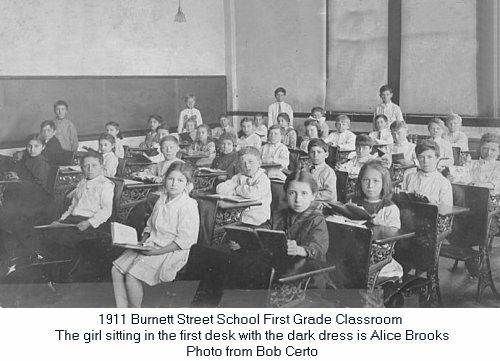 The Burnet Street School originally occupied the Public School House on State Street. The site for this new building is 100 feet on Burnet Street, 92 feet deep, and then extends either way making a rear width of 242 feet, with a further depth of 108 feet, at a cost of $10,000. Subsequently a strip of land was purchased for $150, extending the school lot to Eagle Street. The building is properly two stories, though only the upper story is occupied for school purposes; the first story is entirely above ground and is used for the principals room, ward robes and play grounds. The builders were D. W. Crane & Co., masons, and William Demarest, carpenter. The entire cost of the building, furniture, heating, etc., was $52,500, nearly $3,000 have been expended for alterations and extraordinary repairs since its erection. The building will accommodate 800 pupils, and has been filled from the first opening. The building is heated by steam. The class rooms are all large but the ventilation is imperfect - we have to depend mainly upon the doors and windows. A Primary school was organized in 1855, in the Washington school house, corner of Orange and North Essex streets. The house was built by subscription and held by trustees. It was rented by the Board of Education. It was a stone building, two stories high, with one large room on each floor. About two hundred children used to congregate here, year after year, until the Burnett street house was built, when the school was transferred to that where it occupies seven rooms.